Liar and Spy written by Rebecca Stead is an interesting book that keeps the reader guessing at every page. With so much anticipation, the author can keep you reading for hours. The book has a fast beginning that I personally enjoy. The ending of the story was surprising and not my favorite, because it is very abrupt and changes your understanding of the entire book. 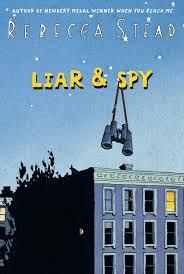 Liar and Spy has a complex plot that involves having to overcome challenges at school and home. In the beginning the main character Georges (the “s” is silent) has just moved out of his house in Brooklyn because of financial reasons and into an apartment . Georges is a twelve year old boy whose only friend is Safer, the other main character, who he meets in the spy club meeting. Safer is twelve years old and always carries around a flask of coffee which he take sips of all day. Safer is a self appointed spy and the leader of the spy club. In the first meeting, Georges also meets Safer’s little sister, Candy. One of my favorite characters in the book is a nameless child who Georges and Safer call “Interrupting Cow Joke Kid”. He is obsessed with knock-knock jokes that were funny the first time and then get annoying. My favorite part of the book is part when Georges has a bag of nasty trash in his hand as Safer is spying on Mr. X. The nasty bag of trash drips on Georges pants and shoe while he tries to prevent Safer from being caught spying. In the spy club Georges gets the assignment of helping Safer spy on Mr. X who carries large suitcases across the lobby. Mr. X dress in all black, is frequently out town and speaks occasionally. While in the beginning of the book it seem that no one is doing anything a illegal, it is revealed later in the book that Georges feels differently about the legality issue when they start to break into Mr. X’s house. In the end of the book Georges start to get angry at Safer and not fully understand what is going through Safer head. There is a resolution to all the character’s problems in the end. The ending is surprising because it changes your entire understanding of the book it is a happy ending for all the characters.